This is a CD of mostly original compositions by Howard and Chris, with the full range of styles that you would hear at their live shows – Jazz, Blues, Brazilian, Classical, World Music, and more. In 1969, after playing piano for 10 years, he picked up the diatonic harmonica. Inspired by hearing great Chicago Blues harp players, he figured out the basics of bending notes to play Blues licks. He soon realized that the instrument had notes missing and discovered how to get those missing notes using a technique which he called “Overblowing”. This exciting breakthrough enabled him (and later, others) to play all kinds of music on the diatonic harmonica. 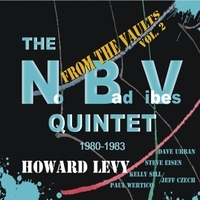 The band on this album – “Howard Levy’s Harmonica Jazz Quartet”, played and toured together for several years. Howard Levy – Hohner Golden Melody diatonic harmonicas, Piano on “Donna Lee”, Fender Rhodes on “The Beauty Around Us”, jew’s harp and percussion on “Epistrophy”.